The day after our trip to Roan Mountain I decided to go to the former strip mine above my home. In a way it was like going to a cemetery with a heavy heart. I stood looking down towards the highway watching some of the people who were driving along and wondered if they might glance at the reclaimed valley fill near my home. 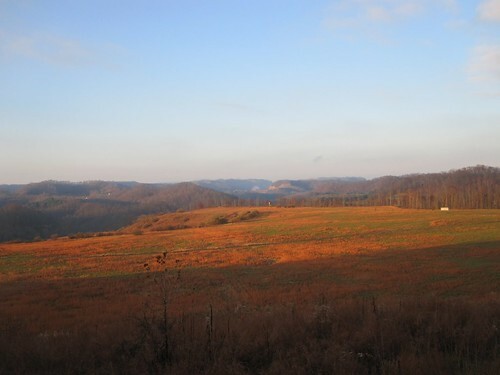 To them I’m sure the brown grasses and autumn olive bushes covering the man-made terrain is just another a former strip mine, another common landscape in this part of Appalachia. A few may remember the valley and mountain that existed here, but I doubt they give it much thought. What is the use? There are more important things to think about: a trip to the store, or getting to work on time. Those people will probably never know that at one point in time this terrible eyesore was my mountain. The legal deeds with their imaginary lines enveloping the mountain were not in my name, but I still felt it was my mountain. I realized it was more than just a massive mound of dirt. It was a place that harbored life. The forests provided shelter and sustenance to the creatures living underneath their canopies. The term ecosystem could not do justice to the magnificent process of life which began and existed on my mountain. Deep within my soul I knew the mountain, and I called it my own and the mountain knew me and called me its own. One day I was told a company was coming to take the coal underneath my mountain. I could do little to protect it, my name was still not signed on the deeds that wielded their imaginary lines, their deplorable concept of mankind’s ownership over the land and life inhabiting it. When the company began logging I hiked to the crest of the ridge where my eyes could barely behold the terror being inflicted upon mother nature. I looked out over an obliterated forest knowing it would never be seen again except within my tattered childhood memories. I nearly wept. “It looks a lot different doesn’t it?” yelled one of the crew who noticed me and approached. He was an older man, gangly and unshaven, and his seemingly wry smile exposed many years of dental neglect. I barely acknowledged his comment as I turned back to the mind numbing sight of so much death. I was morbidly transfixed with the horrific destruction of nature by a species who, within the expansive breadth of time relative to creating such life and beauty, just now stopped dragging their god damned knuckles to wield chainsaws, bulldozers, and the power of explosives. “It will never be the same” I said somberly after an intentionally long silence. He was standing beside me looking down into a valley now barren and naked. The man replied in a matter-of-fact tone that still grates upon my nerves each time I think of it. “Give it fifty years and you won’t be able to tell the difference.” The urge came to strike him down with soul sickening outrage — rage towards a man who knew so little about what he was helping to destroy, rage against a man who only sought a paycheck so he could buy more of the alcohol I could smell on his breath. Ultimately I restrained myself and left his presence, speaking not another word to him. As I climbed back down the mountain I could not hold back the tears of the deep sorrow. I wept. The forest had been forever destroyed and the wonderful creatures who called it home had been displaced with little hope of survival. Only the scars of man’s greed were going to remain. It only took two years for the company to remove the mountain and fill the valley with it. They received a reclamation award for their work. Ten years later I stand upon where the ridge was once highest. All of the life which thrived here is gone, and I, a lone man, am the only part of the mountain that remains standing on a windswept plain. When I pass on, the memory of my mountain and its many splendors will be gone forever, never to exist on earth again. I feel sickened with myself for the greed I once felt, the greed I used to put those memories aside and work for an industry that destroys mountains. Now it is time to help save the others. I owe at least this much to my mountain. Daniel Hawkins is a former coal miner from Virginia. Having finally gotten fed up with current labor practices and environmental destruction within today’s Appalachian coal mines, he has left the mines in search of a better future for his family. 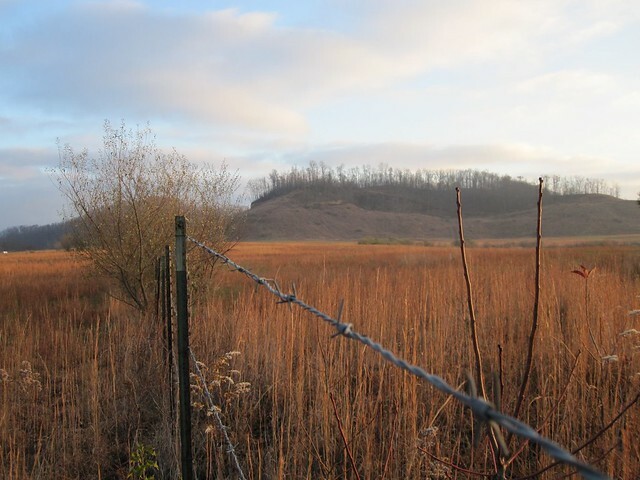 In this series, he looks into Appalachia’s past and possibilities for the future. You can find his full series on his own blog, http://thoughtfulcoalminer.blogspot.com/. This post originally appeared on Daniel’s blog on November 19, 2010.